Please consider making a donation to help maintain the site. Note: Red links take you to other sites. Blue links are internal to the museum. And for what's new, check out The Oval Office weblog and the What's New page. Although the White House is one of the most famous buildings in the world and hosts millions of visitors every year, few people have a good understanding of its layout and history. The building was originally referred to as the "Presidential Palace" or "Presidential Mansion." Dolley Madison called it the "President's Castle." However, by 1811 the first evidence of the public calling it the "White House" emerged, because of its white-painted stone exterior. The name Executive Mansion was often used in official context until President Theodore Roosevelt established the formal name by having "The White House" engraved on his stationery in 1901. The White House sits at 1600 Pennsylvania Avenue in Washington, the capital city of the United States, in the District of Columbia (DC), a federal district carved out of neighboring Maryland and Virginia. Just as it did when it was first completed over 200 years ago, the White House still houses the president's family as well as offices for their top staff (although today, many more "White House staff" members work in the Eisenhower Executive Office Building across the street). The chief usher is in charge of keeping the house running smoothly. He has a staff of 90 workers to assist him: a head housekeeper, five chefs, and numerous maids, butlers, carpenters, plumbers, gardeners, and engineers. The Residence is 170 feet wide by 85 feet deep and 58 feet high (52 m by 26 m and 18 m high). The White House hosts about 5,000 visitors a day, or 1,825,000 visitors a year. The two wings of the White House consist of various parts. In both cases, the body of each wing is a building with two stories. Each is connected to the White House Residence by a gallery (a long, low structure with windows). The galleries both have colonnades (a covered corridor supported by columns), although the East Wing colonnade is enclosed (glassed in) while the West Wing colonnade is open. On top of the galleries are—rather than ordinary rooftops—terraces (wide, open patios suitable for pedestrians). There is also a terrace on top of the West Wing's ground floor on the south, outside the Oval Office. The White House Residence's third floor, on the other hand, has a promenade (an open walkway suitable for pedestrians). The White House consists of three major parts: the East Wing, the West Wing, and the Residence. The East Wing is two stories high, with the Presidential Emergency Operations Center beneath it. The West Wing is two stories high, with the White House Situation Room and other offices beneath it. The Residence is four stories high, with a basement and sub-basement, where various staff and maintenance facilities are located. The presidential mansion was designed by James Hoban and personally approved by George Washington. 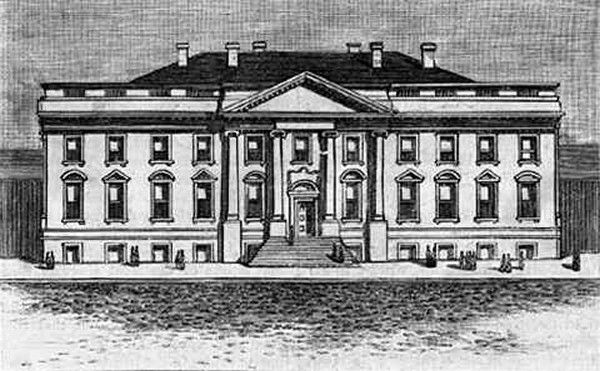 The mansion would be situated on the angled Pennsylvania Avenue at the 1600 block, down the street from the Capitol building. Construction of the White House was was begun on October 13, 1792, with Washington overseeing the laying of the cornerstone. He never lived to see it complete, however, as construction was slow. Second President of the United States John Adams became the first chief executive to take residence in the building now called the Residence on November 1, 1800, while it was still unfinished. The north and south porticos were not part of the structure for three decades. In 1835, running water and central heating were installed. In 1848, gaslight was installed. Covered pavilions and then large greenhouses for growing flowers and vegetables were constructed on either side of the mansion. Victorian ornamentation and decor were added from the 1870s to the 1890s. Electric lights supplemented gaslights in 1891, and the first electric elevator was added in 1898. In 1902, Theodore Roosevelt removed the Victorian ornamentation and restored the mansion to the federal style with Georgian touches. A new roof and third floor were added in 1927. In 1949, after adding a balcony on the south side, Harry Truman's engineers found the rest of the house to be unsound and completely rebuilt the interior, even digging sub-basements. The Kennedys remodeled extensively in the early 1960s and occasional renovations continue today. Before the building of the West Wing, presidential staff worked on the second floor of the Residence. However, when Theodore Roosevelt became president, he realized that the rooms in the mansion were too small for his large family and his staff. In 1902, he had a temporary office structure constructed on the site of the greenhouses. In 1909, William Howard Taft expanded the building and created an oval office for the president. In 1923 is was remodeled; in 1930 it was rebuilt after a Christmas fire. In 1934, Franklin Roosevelt had a second floor constructed and moved the Oval Office to the southeast corner for better light and privacy. He also had a swimming pool and gymnasium constructed in the gallery to allow him to exercise regularly. Many presidents renovate the Oval Office and Cabinet Room. Richard Nixon converted the pool and gym to a briefing room and offices for the press. He also dedicated the conference room to Theodore and Franklin Roosevelt. In 2006, the George W Bush renovated the press areas and enlarged and updated the Situation Room. Along with the West Wing, Theodore Roosevelt also built an early, one-story East Wing as a formal guest entrance. The present East Wing was added to the White House in 1942 in part to balance the enlarged West Wing and in part to cover the construction of an underground air-raid bunker now known as the Presidential Emergency Operations Center. Among its uses, the East Wing has sometimes housed the offices and staff of the first lady and provides a covered entrance to the White House that allows guests to easily flow through the mansion for large social events.